This was the first Red Velvet Cake I ever made. I usually use fondant or fresh cream to decorate my cakes, but this time I decided to use something different. I used two different kind of cheeses, plus fresh cream of course! Cream cheese and Mascarpone cheese are a very nice choice when frosting cakes, so this recipe had a combination of both. Since I am still on a diet I did not taste the cake, but as I was told it was very good, especially the frosting! Below you can find the recipe I used. 1) Preheat oven to 170ºC. 2) In an electric mixer beat sugar, eggs and food color, at medium speed, for 8 minutes. 3) Sift together flour, cocoa powder and baking powder. 4) Add flour to the egg mixture, stirring gently until well combined. 5) Pour mixture into two 20cm round pans and bake for 20 minutes. Let them cool completely, on a wire rack. 6) Cut each cake horizontally. 1) In a small pan boil, for 2 minutes, water and sugar. 2) Remove from heat, add rum and let cool completely. 3) With a spoon, pour syrup onto each cake layer before you frost it. 1) In an electric mixer beat cream cheese for two minutes. 2) Add mascarpone cheese, icing sugar and extract, and continue beating for another 5 minutes. 3) Finally add fresh cream. Beat mixture for 2 to 3 minutes. 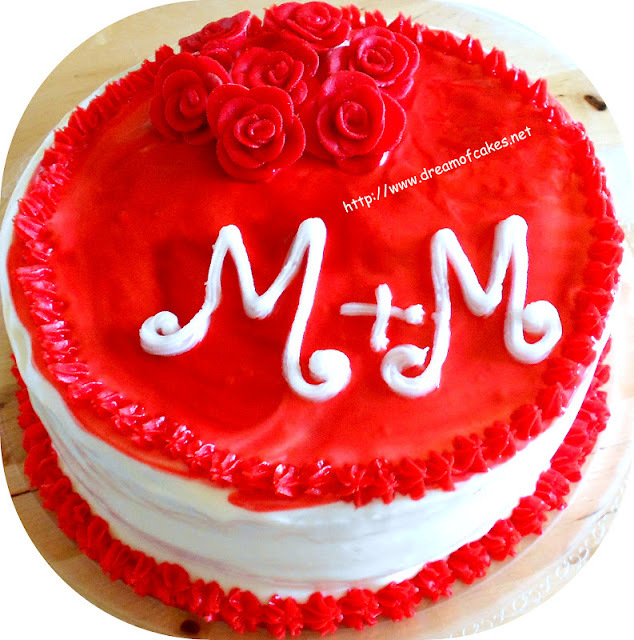 4) Use frosting in between cake layers and for the final frosting decoration. WOWWWW What a GORGEOUS cake !! Wow, this is gorgeous!!! I love your beautiful floral topping! And way to go with your willpower! You are so talented! Very nice! Ooh, mascarpone frosting... sounds amazing! Oh my gosh this is divine. Very bold and beautiful red color. This would definitely be the first dessert seen on a serving table. Quite attractive! This cake is absolutely beautiful and I love the 2 cheese frosting! Wow you got a gorgeous red colour for both the sponge and the frosting. 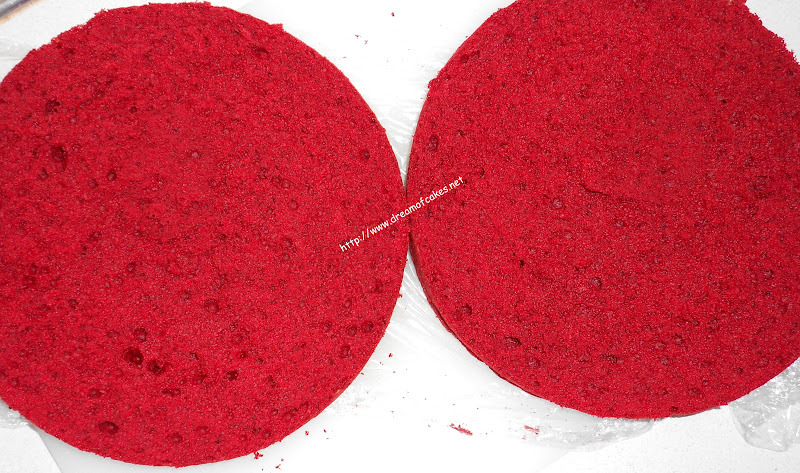 Many times red velvet cakes look more brown than red. It looks so perfect and delicious.